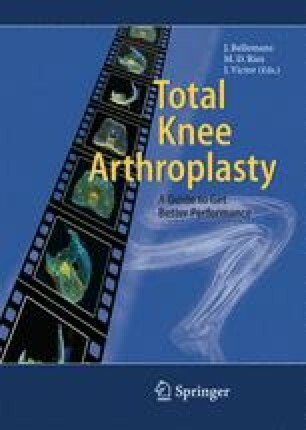 Knee kinematics were analyzed in subjects with unicompartmental knee arthroplasty (UKA) during deep knee bend (DKB) and stance phase of gait, using video fluoroscopy. Femorotibial contact positions were determined using a computer-automated model-fitting technique. During DKB, subjects with medial UKA experienced on average −0.8 mm of posterior femoral roll-back (PFR), those with lateral UKA −2.5 mm. During stance phase of gait, subjects with medial UKA experienced on average 0.8 mm of PFR, those with lateral UKA −0.4 mm. During DKB normal axial rotation was found for two thirds of subjects (average = 3.3° and 11.2°, respectively, for medial and lateral UKA) and during stance phase of gait for half of the subjects with medial UKA and one quarter with lateral UKA (average of 0.9° and −6.0°, respectively). On average, subjects with UKA experienced kinematic patterns similar to those of the normal knee. The kinematic variability for some subjects suggests progressive laxity of the anterior cruciate ligament, which confirms its role for maintaining satisfactory knee kinematics in UKA.